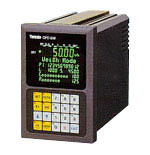 Digital Indicators are possible collective control of multiple indicator by CC-Link communications with the PLC. ※1　There are Analog loadcell model and Digital loadcell model. ※2　EDI-2200 is conform to international standards. Please consult for use area and purpose.